October 4, 2015 | By KNews |- Another Guyana-born jurist has continued the rich tradition of his countrymen of holding down top legal posts in the Caribbean. Arudranauth Gossai, a Guyanese Hugh Wooding Law School Graduate has been appointed Acting Director of Public Prosecutions for St. Kitts and Nevis. At age 36, Mr. Gossai, former Crown Counsel in the St Kitts and Nevis Attorney General’s Chambers is believed to be the country’s youngest DPP. According to reports he has been appointed to act in the post for three months and made his first appearance at Court in his new position on Thursday. Gossai worked in St. Kitts and Nevis’ Attorney General’s Chambers from 2005 to 2012 and during his stint as Crown Counsel, he also served as a member of the legal team representing the government on several high profile ‘political’ cases. He moved into private practice in 2012 working as an Associate Attorney with Gonsalves Parry. Mr. Gossai has served as Counsel to the National AIDS Secretariat, and in various capacities with the Saint Christopher and Nevis Bar Association. He is currently a member of the Association’s Disciplinary Committee. Arud, as he is popularly called, holds a Bachelors of Social Sciences Degree in Business Management from the University of Guyana (1999); and a Bachelors of Law from the University of Guyana (2002). Gossai was admitted to the local bar in 2004 and to the St Kitts bar two years later. The post of DPP had been vacant since September 21, following a legal settlement between the former DPP and the Attorney General. The former Director of Public Prosecutions, Travers Sinanan, had filed suit against the Attorney General Vincent Byron Jr., challenging the government’s decision not to renew his contract. 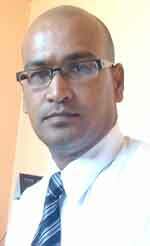 According to a source, the new DPP of St Kitts is a close relative of local Attorney-at-Law Bernard Da Silva.